The Zapier and ManyChat integration is live! Find out 4 ways you can integrate Zapier and ManyChat into your business in this post right now. 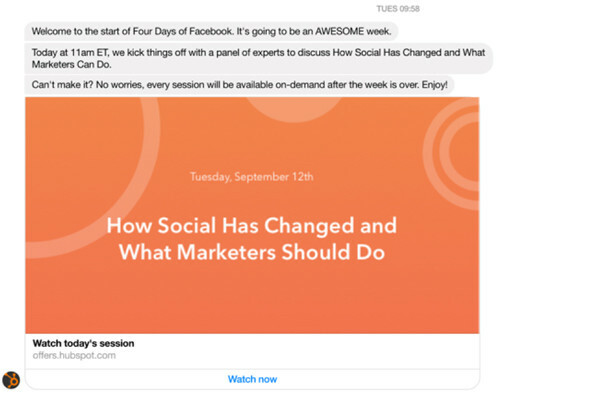 On September 8th, 2017, ManyChat and Zapier officially launched an integration that would give business owners and marketers hundreds of ways to integrate Facebook Messenger bots into their current business systems and tools. 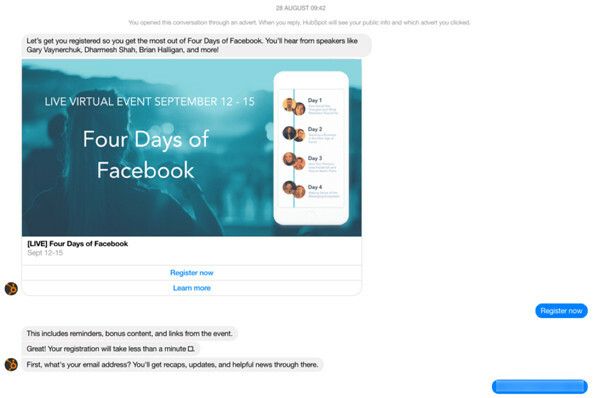 This is one of the biggest happenings in messenger marketing to date. 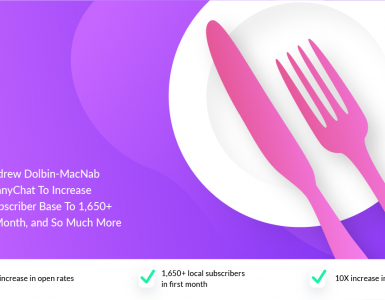 Over the past year, ManyChat has aided in the growth of thousands of businesses. How do I send leads generated through ManyChat to my CRM so that I can follow up via email or on the phone? Can I connect ManyChat with my current customer service platform… so that my team isn’t having conversations in two platforms? How can I tell if someone who interacted with our Facebook bot is already a buyer or lead? How do I integrate ManyChat into the other tools and systems I’m using in my business?! And now we FINALLY have the answer: Zapier! Read on to get the full scoop on what exactly Zapier is, and 4 ways to integrate ManyChat into your business! Zapier is an online automation tool that connects your favorite apps, such as Gmail, Slack, MailChimp, and over 750 more. 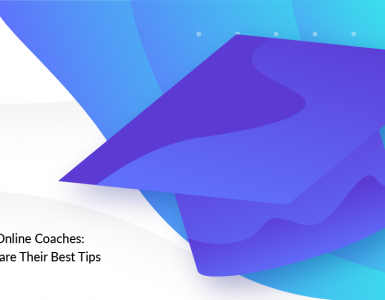 You can connect two or more apps to automate repetitive tasks without coding or relying on developers to build the integration and move info between your web apps automatically—so you can focus on your most important work. It’s easy enough that anyone can build their own app workflows with just a few clicks. Long story short, Zapier is the “connector” between tools in your business. To get started, you’ll need a Zapier account and a ManyChat Pro account. Keep in mind that Zapier works with triggers and actions. Learn more about how Zapier works here. Now that you have things set up… what should you do? Here are some ideas to help you get started. 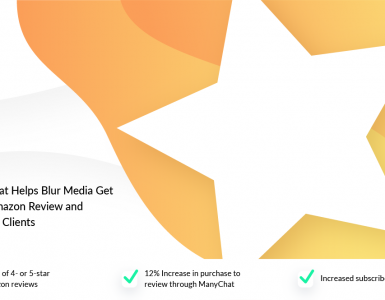 4 Zapier + ManyChat Strategies to Integrate Into Your Business… Today! If your business utilizes webinars, online events, or live events, this integration is going to make that process more seamless for you and the end user. Traditionally, marketers create a live or perpetual webinar landing page where people can sign up. This means you need to buy Facebook ads, email your list, etc. to send people to that page. This strategy still works, but what if you could skip the landing page altogether? Say 1,000 people click on your Facebook ad and therefore visit the registration page. If you have a 50% conversion rate, then 500 people would register for your webinar. If you have a 50% show up rate, 250 people would actually attend. 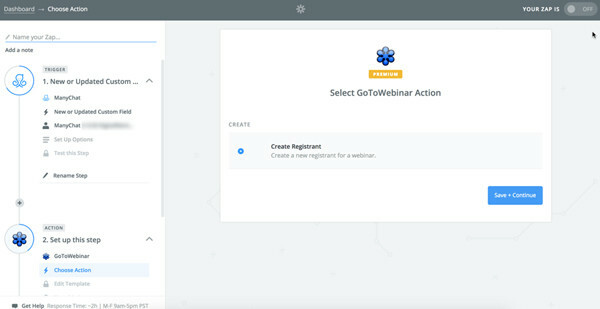 By integrating ManyChat with your webinar platform (GoToWebinar, Zoom, etc.) you can increase registration and show up rates because the process is more frictionless for the end user. You can remove the need for a registration page all together and use messenger as a way to remind people to show up, watch the replay, etc. Ultimately, increasing registration AND show up rates. 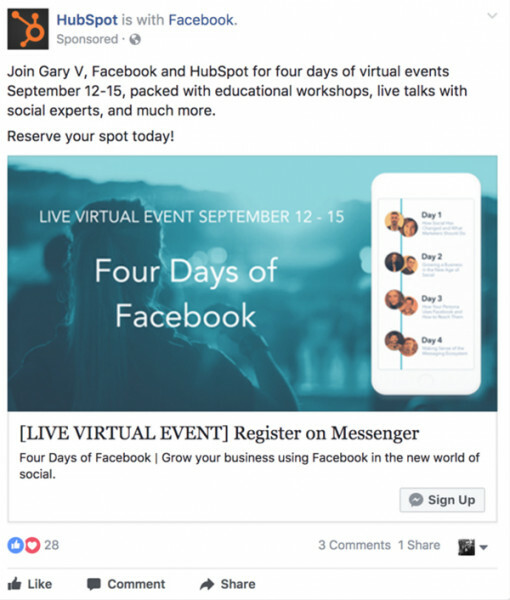 The communication from HubSpot via Messenger stopped there (as of now), but remember that you can continue to follow up with registrants inside of Messenger with any follow-up information or offers you made on the webinar. 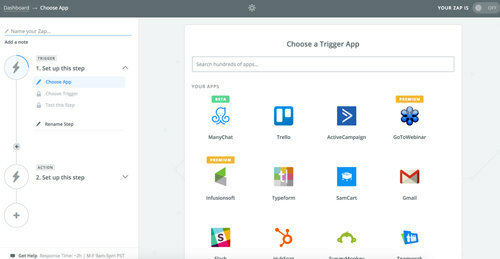 Through Zapier, you can now connect ManyChat with almost any webinar platform to create a similar experience as the one you see above for your business. But, your integration doesn’t have to be as complex as HubSpot’s. Check out this video for utilizing ManyChat with GoToWebinar! This new integration now allows us to push data about prospects that are chatting with us inside of ManyChat to our CRMs. For example, you could create a Facebook ad promoting a “Lead Magnet”. This is something of value (a template, coupon, guide, etc.) that you give in exchange for contact information. Once the prospect shows interest in the Lead Magnet by clicking the ad, you can then ask them questions (similar to the webinar sequence above) to generate the info you need. … and many more, the opportunities are endless. Just like the webinar sequence that we covered above, this provides a frictionless experience for the end user and removes the landing page all together. The best part? 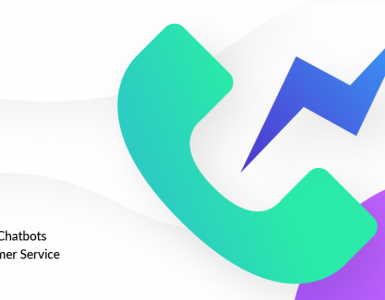 You’re STILL able to generate the contact information that you need and it pushes directly to your CRM (as long as that CRM integrates with Zapier). Check out this video tutorial for pushing contact information from ManyChat to MailChimp! 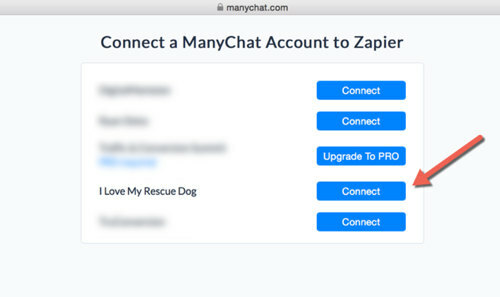 Another opportunity that the Zapier integration provides is integrating your customer communication platform(s) with ManyChat. This solves the problem of teams having conversations inside of their customer service/sales platform (hubspot, salesforce, zendesk, desk.com, etc.) AND inside of the live chat feature in ManyChat. Having conversations in two platforms causes confusion about which rep is speaking to which customer. When you’re in two platforms, you also aren’t able to access historical data on past interactions with prospects and customers. 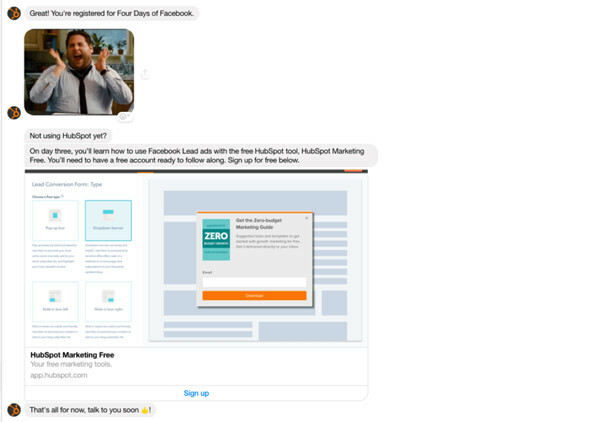 The new Zapier and ManyChat integration allows you to solve this problem and to push the conversations you’re having inside of Facebook Messenger into the same platform that your team is already using for forward-facing interaction. If you’re looking for a simple way to notify your sales team when someone is “qualified” and ready for a human to human conversation, you can leverage the Slack integration to facilitate a quick response. For example, imagine we are an advertising agency. 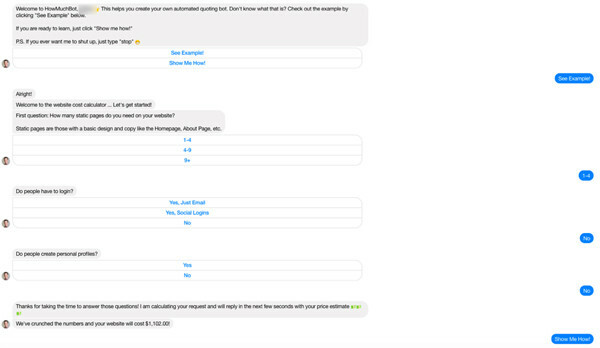 You could create a sequence that asked prospects in ManyChat a series of questions. One of those questions could be about their ad budget. If they answered that they had a budget of 500k+, you could apply a tag in ManyChat. You could then set up a Zapier that notified a Slack channel (of your sales team) that there was a qualified lead in ManyChat and that they should act quickly. There are so many exciting possibilities in this department. We’re excited that this integration will help make your team’s life much easier! With 750+ integrations, the opportunities are truly endless with Zapier + ManyChat. 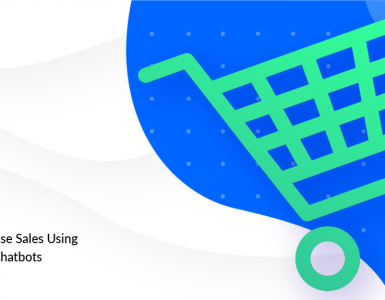 Inside of our community, we’ve already seen a number of fun use cases where members are using this integration to engage, entertain (and eventually sell to) their audiences. (To see his bot in action, click here). How powerful will this be for agencies or any business that provides a quote to prospects!? What can you create with this new integration that will help grow your business, or make your customer’s experience even better? Want to learn more about ManyChat? Learn more here! Dan Gamito is ManyChat’s Business Development & Partnership Manager. He hails from Portland, Oregon, and loves eating pork belly and drinking beer! Dan has a passion for developing products and tools which help companies grow their relationships with their customers. Thanks a lot Dan, I love the way you show the value of the tools…real efficient and idiot proof 🙂 Keep’em coming! Thanks a lot for the article. 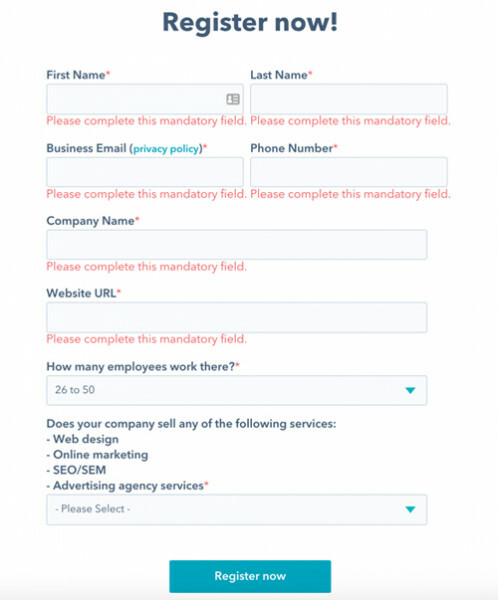 I really want to use Hubspots example, but I don´t understand how to start the conversation from the ad to Manychat, can I tag users into a specific sequence? Any idea how we can make that work…? I do have a subscriber on the facebook page but… no email address..
You would have to use an User Input Card in a Flow in ManyChat to collect the Email address – then pass it to Zapier then to AWeber. Dan you the man! 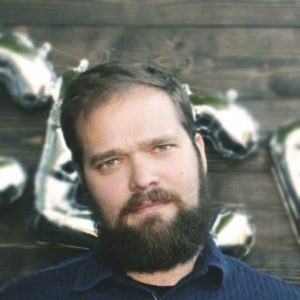 Love your videos – have watched alot of chatbot tutorials and enjoy yours the most! I was able to add each new user to hubspot, but zapier does not appear to have an integration for hubspot as a live-chat back and forth with the user. I checked the others in your list and only intercom appears to have such an integration (but I haven’t tested it). So I love the tutorials and have integrated many of them already. Is there a way to take all the questions I created in my Ref URL tool and have all the answers populate onto a Google Spreadsheet?